Correct care of your cuticles is an essential part of overall nail care and manicure and pedicure. Extra Bonus: Enjoy the free storage bag with this cuticle trimmer set. Sharp Blades: Sharp blades crafted for clean and even cuts. Never hurt your nails. 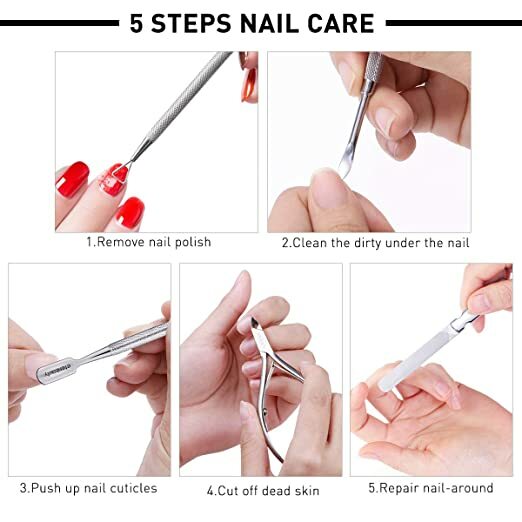 In contrast to traditional cuticle pusher, it is easier and more comfortable to remove nail polish and dead cuticles, without pulling or hurt. 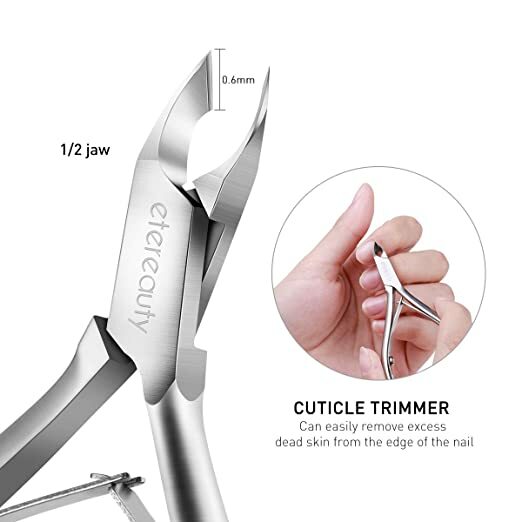 Half Jaw Cuticle Trimmer: This allows for easy maneuverability in small areas. With this jaw size, you can remove those cuticles and dead skin even in or around small areas that cannot be reached by other nippers. 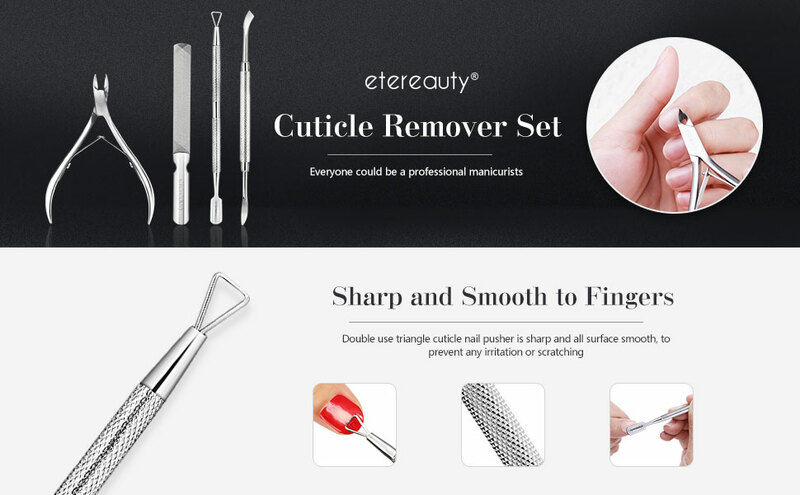 Ergonomic Handle: Easy to hold grips ensures this professional cuticle remover tools set will cut where you need to without fear of losing control while nipping damaged cuticles. Stainless Steel Built: This premium quality stainless steel built & rust free cuticle cutter is built to last and retain sharpness for a very long period of time. 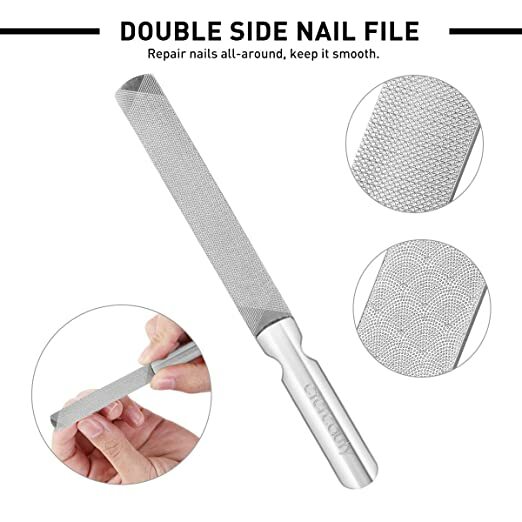 doule sided nail file: repair nails all-around. 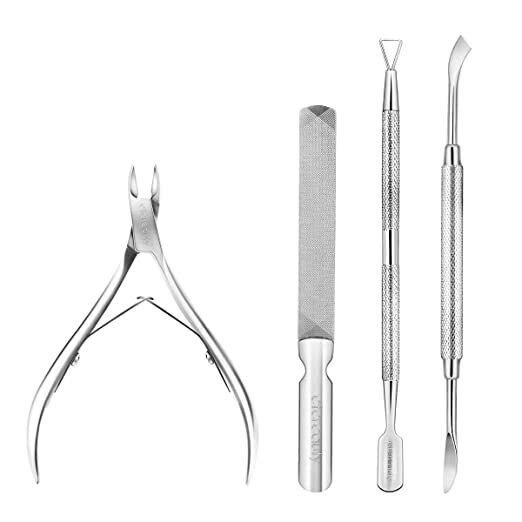 PROFESSIONAL CUTICLE REMOVER TOOLS. 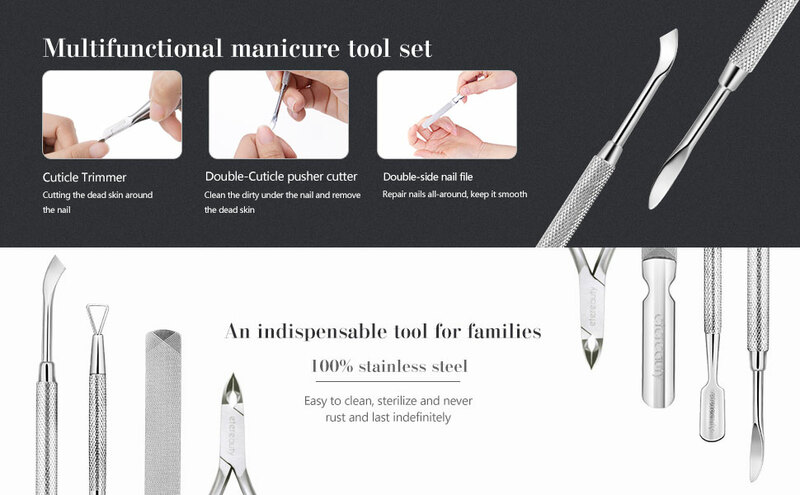 This manicure tools contains cuticle trimmer, cuticle pusher cutter, cuticle pusher and nail file. It can meet the requirement of your nail care one-stop service and nail care can be done any time. PERFECT FOR REMOVERING DEAD CUTICLE AND GEL POLISH. 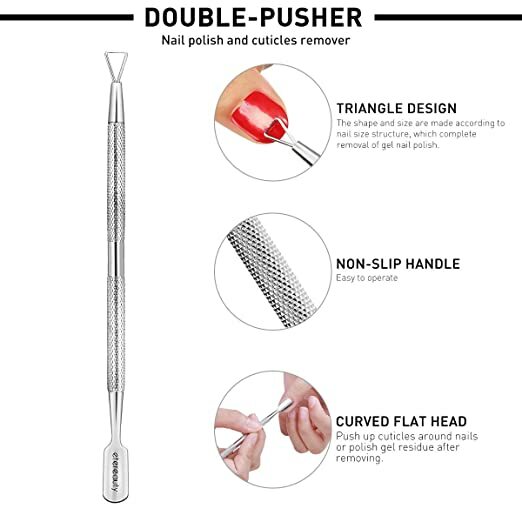 Dual end cuticle pusher is easier and more comfortable to remove nail polish. 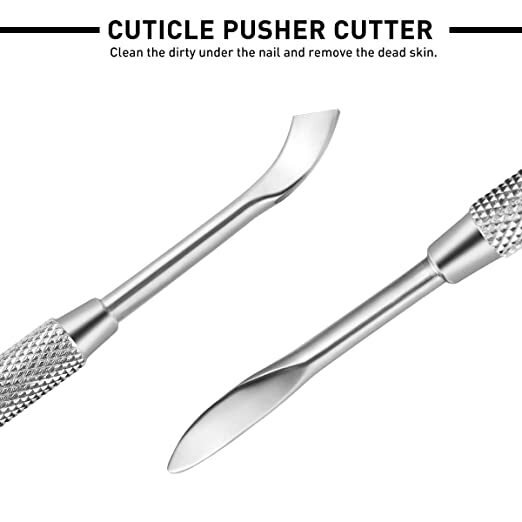 Nail pusher Sharp to cut or scrape away dead cuticle; Curved flat end perfectly pushes the skin back smoothly. POLISHED STAINLESS STEEL MATERIAL. Durable stainless steel resists wear and tarnish. They are to assure a long lasting cutting edge. And can be sterilized without rusting and it keeps the precision cut every time you use it. NO-RISK PURCHASE! UNCONDITIONAL MONEY-BACK GUARANTEE. If you're unsatisfied with this item for any reason, we'll immediately refund your purchase price.